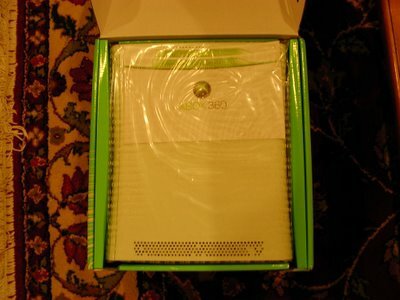 Yes, it was pretty damn cold in line yesterday morning, but it was arguably worth it, and we're talking mostly about the media-centric features of XBOX 360. Here's a closer first look at all the action, and we have to say right up front that Microsoft is neither kidding, nor over-positioning, when they say this isn't just a game box. 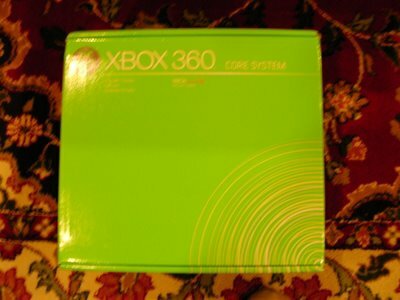 Especially if you own a Media Center Edition PC, XBOX 360 is a must-have companion. 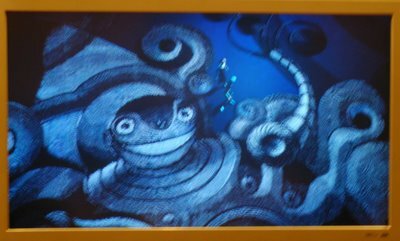 NOTE: Any image quality issues in the below (fuzziness, lighting, etc.) are artifacts of sleep-deprived midnight photography by the Editor, not the XBOX 360, which is spitting out clean, beautiful, paper-cut sharp 1080i! 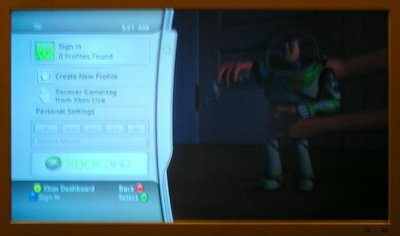 Wireless controller sync: Here's a picture of the XBOX 360 and Controller both lighting up the upper left segment, indicating that controller has been designated Player 1. 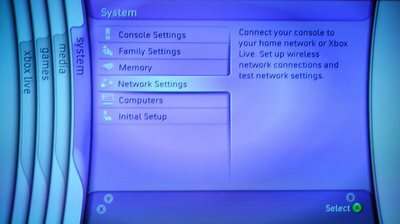 Media set-up: The network and media set-up interface is as elegantly simple as the rest of the well-integrated XBOX 360 Interface. 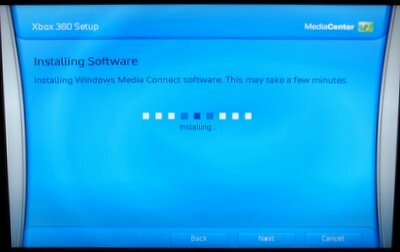 That having been said, you can see in the pictures that our enjoyment was interrupted by having to run back to the PC to install XBOX 360 updates (which we had already spent what seemed like half an afternoon upgrading to Windows XP Media Center Edition 2005 SP2 Roll-up 2). 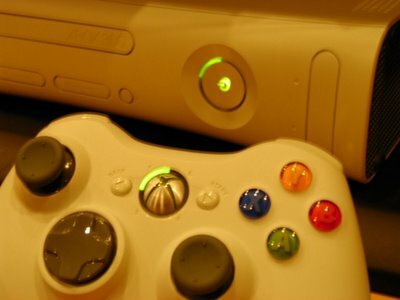 If there's a negative comment to be made about the XBOX 360 media experience it is on this point. 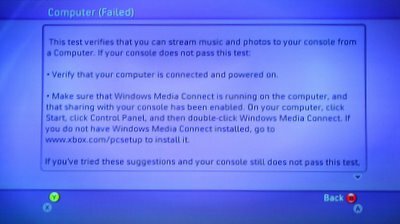 While installation (and reboot) is no problem for the desperate geek, "Middle America" would clearly be put off by this part of the show. 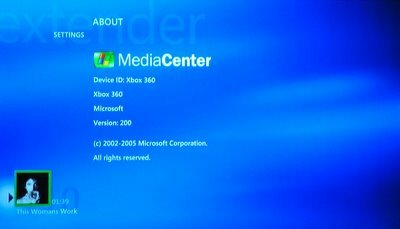 Media Center interface: But, finally we are rewarded by the Media Center Extendcer interface on the XBOX 360. 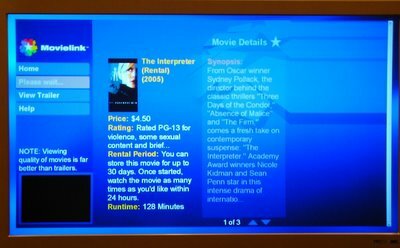 The experience, including responsiveness and animation of the interface is practically indistinguishable from using Media Center on the PC. Nicely done! 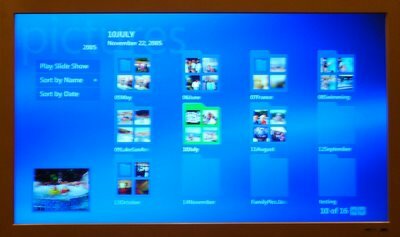 My Pictures: Everything functioned as expected, although we don't have a good feel for the resolution of the files we were looking it. This needs some more research. 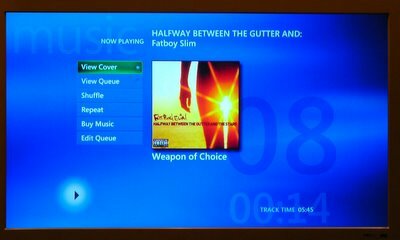 My Music: Everything functioned as expected with no problems for mp3s ripped from CDs, and no access whatsoever to iTunes Music Store songs. 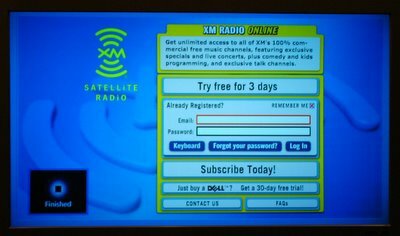 Following Yahoo's (predictable) raising of introductory prices for Yahoo Music Unlimited we let our subscription lapse, so while the songs were still in our library, XBOX 360 gently reminded us that we no longer had rights. We believe, but cannot guarantee, that if our subscription was active these premium files would also have played without a hitch. 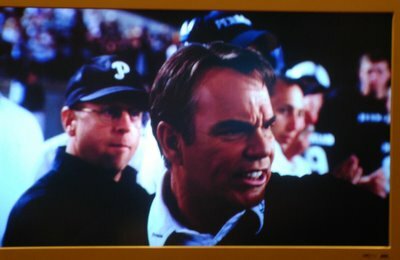 720p High Def Windows Media video (Friday Night Lights and Robots, downloaded from WMVHD.com) DID PLAY, and looked spectacular. 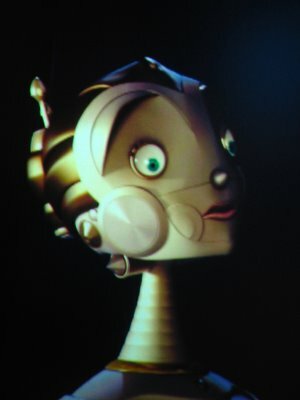 The close-up of the robot below is actually only a small part of the full picture. 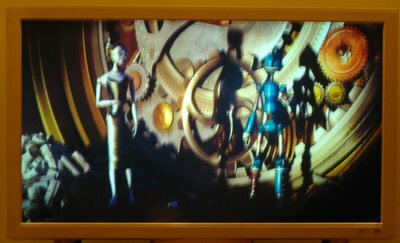 Trust us, it looked very good (at least progressive scan DVD quality, if not better). This was perhaps the most pleasant surprise of the entire evening. 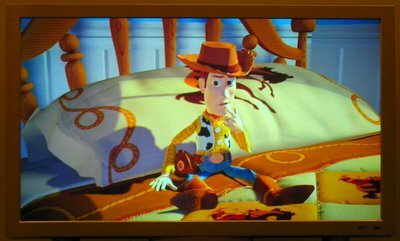 DVD playback: Woody and crew from Toy Story looked predictably good. 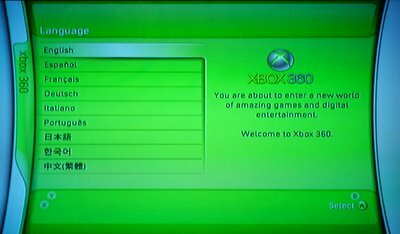 You can also see below how consistently well the XBOX 360 user interface is integrated over background functions (DVD playback in this case) when called up through the round-"X" media button on the controller (or remote). Quick word on games: We did quickly hit the three games we had available: PGR3, Amped 3 and Tiger Woods 2006. As indicated by reviews elsewhere, PGR3 is the best looking of the three (although our household prefers the slightly more arcade'y gameplay of the Burnout series ... guess we have to wait until March for that), with Amped 3 looking good and promising a wildly creative and entertaining experience, and Tiger Woods showing excellent draw distance, but otherwise feeling like only a mildly inspired port of their previous efforts. 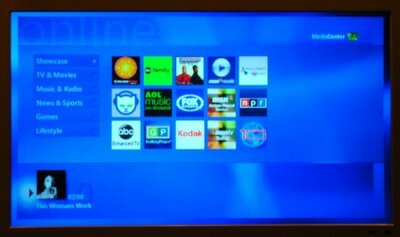 BOTTOM LINE: We're impressed with the overall XBOX construction, simple, well-integrated interface and user experience, but are especially enthusiastic about the media-centric features. 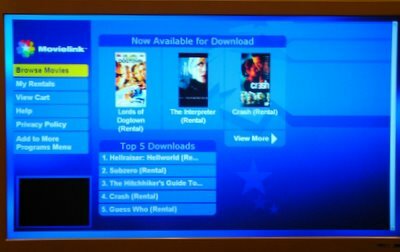 With XBOX 360's uncompromised Media Center Extender functionality we have the first entry in extending media throughout the home that you can confidently show (and hand over) to your friends and neighbors. 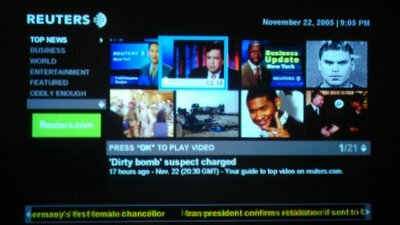 Only set-up issues prevent it from being an all-out revolution at this point in time. 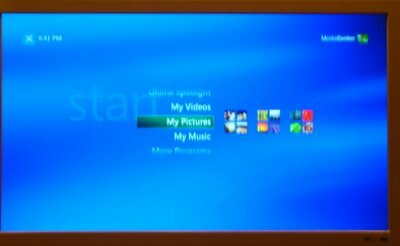 It'll be interesting to see if the arrival of Vista puts things over the top.